The goal or objective of this article is to provide our residential homeowner readers with the steps for cleaning bathroom floors on a daily regular basis. Daily or routine cleaning when it comes to cleaning bathroom floors is not difficult. However, there are some things to consider when deciding how to clean bathroom floors. The type of flooring is an important consideration. 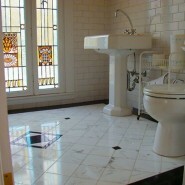 Another consideration is when to clean the bathroom floors in the total bathroom cleaning process. This might seem like a question or consideration that has not direct effect on cleaning bathroom floors but it does and it is a simple but perhaps the most important consideration when cleaning bathroom floors. What we mean by total bathroom cleaning process, is when you clean the bathroom floors. Do you clean them first, second, last etc? Usually total bathroom cleaning includes all the bathroom surfaces including toilet bowls, sinks, mirrors, light switches, countertops, floors, etc. The proper step is to clean the bathroom surfaces starting from the highest from the floor toward the floor itself. Meaning that for best results, you’re last cleaning task when cleaning a bathroom would be the clean the bathroom floor last. This will allow you clean up any mistakes, soils, drips, etc that may have occurred during the cleaning of the other bathroom fixtures and surfaces. This is will allow the homeowner to minimize any extra work in touching up the floor since it is already done last. Seems simple, right? But over the years we have discovered that many people clean the bathroom floors first. If deep cleaning of ceramic tile and grout is the topic you are interested in, please visit a prior article written on deep cleaning ceramic and grout floors – (Cleaning Ceramic Tile Floors – Deep Cleaning and New Product Innovation). Dust mop or Sweep Floor. Using a putty knife or scraper, scrape any debris adhered to the floor such as gum, labels, etc. Fill a bucket with quality grade Neutral or disinfectant Floor Cleaner using according to label directions. Using a wet mop, damp mop the cleaner solution uniformly on floor with the mop or manually scrub the floor with a Magic Eraser type cleaning hand pad like Mr. Clean or the “That’s Amazing” Cleaning Hand Pad.